Sigma's Spa Brush Cleaning Glove has been making its rounds in the blogosphere/beauty-guru-sphere, and naturally, being the avid beauty fan I am, I had to check it out. I though the concept was a good one, but I had my doubts over whether a simple silicone glove was worth US$35 or not. Then, I realized - all it really brought to the table was just a textured silicone surface to more effectively dislodge makeup and dirt from the brushes during use. And certainly, this was something dupe-able, right? A cheap alternative to the Sigma Spa Brush Cleaning Glove: US$35 vs SGD$2, worth a shot! I'm sure you're wondering, how does it perform? Does it really work? So I gave it a go, and I think it does work! There are little bumps, ridges, lines and other textures on the surface which are supposed to help as your wash your brush. 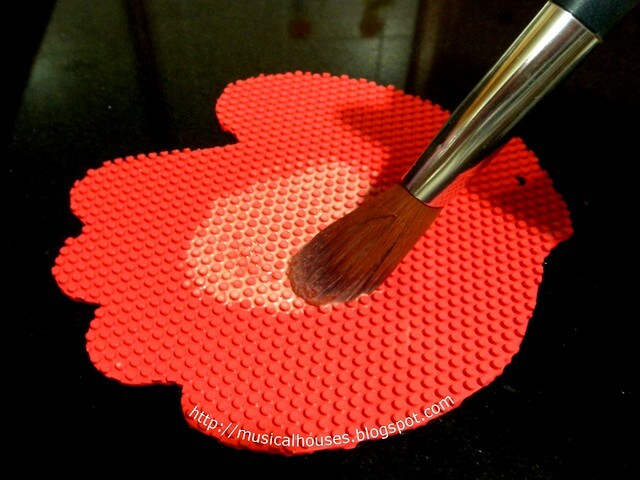 Basically your rub your brush bristles along those bumps and ridges to help your brushes get clean. The first thing I noticed when I took out this Daiso mat was that it had a somewhat plastic-y smell about it. The smell eventually dissipates slowly over time, but it made me wish that I had picked, out of the many silicon mats one could choose, something that didn't have that smell. 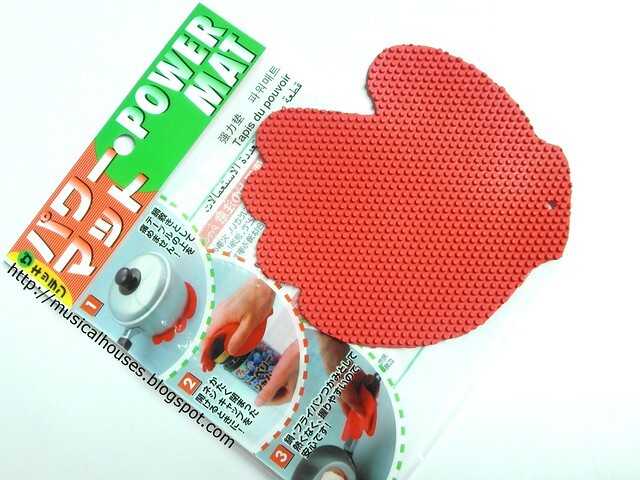 I think on my next Daiso visit, I'll pick a different mat with no smell. Anyway, I set about washing my brushes. Being cautious, I picked a synthetic hair brush to test first. 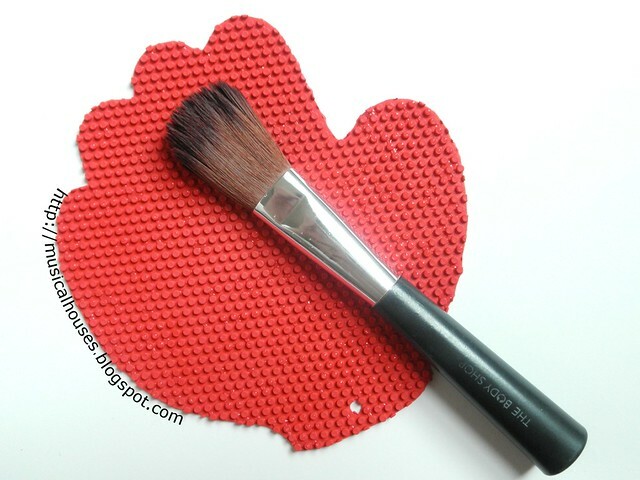 I picked my The Body Shop Blusher Brush (previously seen in this brushes comparison post). I don't know about you, but I feel like it's so much easier to ruin natural hair brushes through improper washing than synthetic brushes. I think it's because natural hair bristles seem to be a bit more porous, so an overly harsh soap, or an overly harsh rubbing of the brush bristles can really make the natural hair bristles all roughed and brittle. So, since I was testing out this new brush-washing aid, I thought I'd start with a synthetic bristle, which isn't porous at all and thus less susceptible to rough treatment. Daiso silicone mat in action: All the gunk coming out! So, above you see my The Body Shop Blusher Brush getting all clean. This is just hand soap (yes, I totally use a mild hand soap for my synthetic bristle brushes - I did say they were hardy! My natural hair bristles get a proper brush cleaner, haha), water, and my brush being swirled around on top of the bumps of the Daiso silicone mat. Look at all that gunk coming out! In the photo I have placed the silicone mat on the counter top, but you can hold it in your hand too, if it's more convenient. I just placed the silicone mat on the counter top for the photo so I could have one hand free to take the photograph! And below, you can see the final results. Yay, clean brush! I have to say, this really works. While you can certainly get your brushes clean by massaging using your own fingers, this just makes it easier to massage the bristles, because those little bumps are doing it for you! I think the advantage is that the little bumps help you to get the job done faster. Boldened by my successful experiment on my synthetic hair brushes, I graduated to one with real natural bristles - my Stila #24 Double-Sided Illuminating Powder Brush, using pretty much the same technique, except that instead of hand soap I used a proper brush cleaner. And yay again, clean brushes! The natural bristles didn't break or anything despite the swirling against the silicone bumps - I guess silicone is a soft enough material to not damage the brush bristles! Fortunately, the plastic smell of the silicone mat didn't transfer to my brushes either, thankfully! So, what's my final verdict? While I don't have the Sigma Spa Brush Cleaning Glove to compare this to, I daresay my $2 Daiso equivalent probably functions in very much the same way, because, at the end of the day, fundamentally both the Glove and the Daiso mat are just textured silicone surfaces to rub your brush bristles against so they get clean faster and easier. 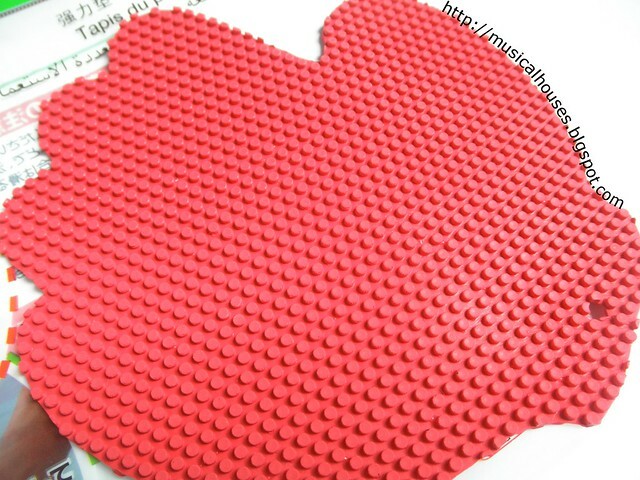 If I could, I would probably pick a silicone mat with minimal smell, just to make it more pleasant for my own use. 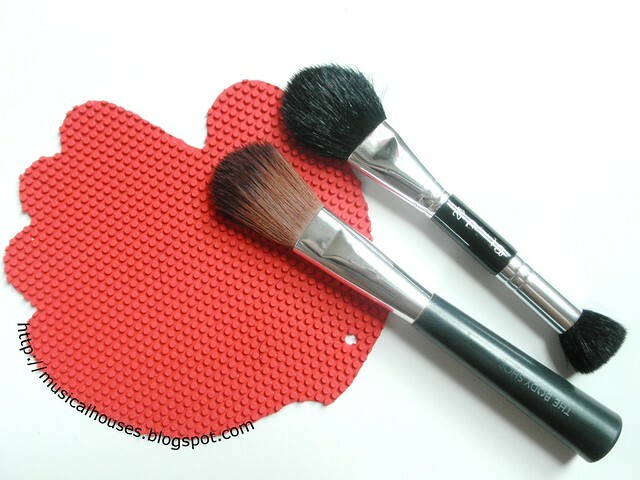 I might just head back to Daiso and get a couple more mats to clean my brushes! I bought a silicone oven glove specifically for the purpose of washing my brushes. I do fine the textured surface helps in getting the dirt out, but mostly I am glad that I don't have to swirl the brushes in the palm of my hand anymore. I use Dr. Bronner's soap so it really, really dried out my hands! I love Daiso! I also picked up the laundry spot scrubber thing there which is identical to the Brush Egg I've been seeing on some blogs. Definitely makes cleaning brushes less of a chore. Yay Daiso wins again! Seriously this is genius. Spending that much on a silicone mitt is just silly. Loving this idea! I have to say, as soon as I saw the price tag on that glove I knew there was no way I was going to buy it.... For a silicone glove? Really??? Thank you.